Bot interfaces are fun for the users and advantageous for those who build them (if done right). The concept isn’t new, though today it’s especially powerful. For developers, bots mean less time spent designing and building custom interfaces. It’s just text bubbles; plus many existing platforms offer to completely avoid this process with their already-successful apps’ APIs (i.e. Google Assistant). For users, bots mean a possibility of hands-free interaction (via voice) and a more natural and/or seamless way to converse with machines. 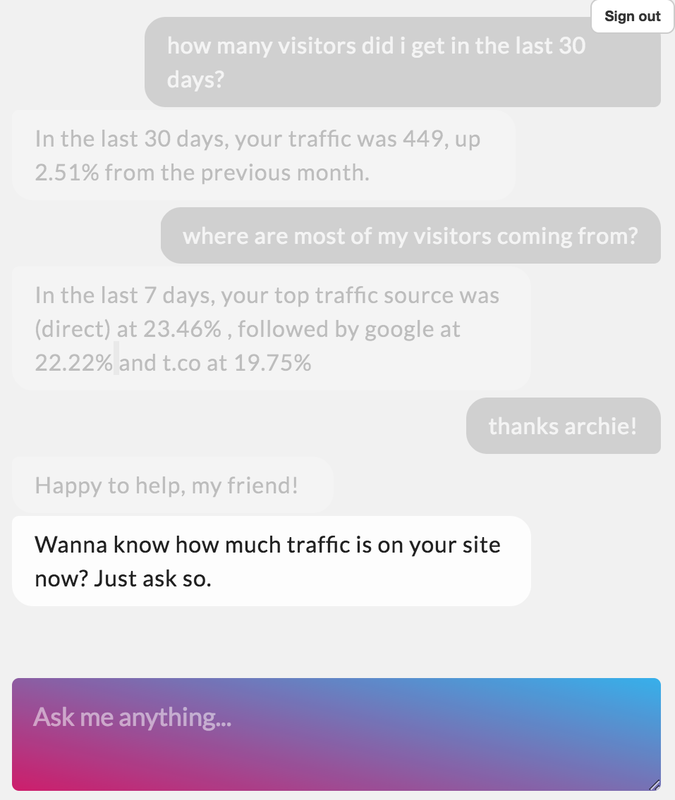 My team and I have implemented and trained a natural language classification engine, Archie.AI, and gave it the power to understand and generate answers from Google Analytics. The bot can give daily briefings about users’ state of business, predict the number of future visitors and answer over 430 related questions. It’s an excellent way to save time when looking for a particular metric or an instant business advice. Batteries included: a complete set of CSS styles and percision-timed animations, an ability to safely run functions in response to user actions, and a pluggable processing engine. Give your users options, which appear as buttons (see gif below). Nothing needs to be done here, this is built-in.Use the provided sample code that utilizes a simple fuzzy-matching logic to map your users’ input to the options you prescribe (see gif below).Plug-in your own NLC engine (see gif above). Over the next few months, we tested the script in production with about a thousand users, while adding a few tweaks and improving performance on older browsers. It has also been downloaded over 700 times as of today. The library works equally well on desktop and mobile. However, when it came time to publish it as a part of our Google Chrome browser extension user experience suffered. Because chat-bubble had no inherit persistence, the conversation history would evaporate every time the plugin window is closed. And that happened quite often as Chrome tends to kill the DOM of the plugins entirely each time the user shifts focus. There is no one way to keep the conversation history in on disk. I considered using Redux to manage the state, however, that’s a dependency and the philosophy so far is not to have one. That would also over-complicate things. Have the potential to be used with a database or any other data storage method.Have different UI interactivity and style than the rest of the bot (a visual cue for the user).Be a progressive enhancement that doesn’t break the rest of the app. chat-bubble-interactions is the LS key for keeping in-touch with the chat history. The only roadblock I can see here is having to add a Promise -type checks to make sure that everything needed to display history is downloaded before proceeding. Something like this might take some work as there would need to be a few decisions made regarding when the download should start and what functions should it block. I’m leaving that for tomorrow. Custom UI for recalled conversations. Note the “greyed-out” style for this recollected conversation up top. To keep things simple, previous conversations would appear in the chat as soon as the user opens it. However, as a side-effect of that decision, those conversations would have to be styled differently to avoid confusing the user. Additionally, the user responses would need special attention when stored and recalled, since user responses can not have any interactivity associated with them. What I mean is that while highlighting chat bubbles in black and floating them right for user responses isn’t that hard there are implications when the chat uses buttons instead of keyboard input messages. Read on. Consider the example (below) when the user is presented with options to select one of the two or more buttons as a way of answering to the bot. Obviously storing answer options in history isn’t helpful — they have nothing to do with conversation structure after they’ve been interacted with. Only the user’s response (their selected answer bubble) is relevant. The trick is not storing anything in history until the user has created their final interaction. Note how the answer options no longer appear in the conversation history. For this purpose, I’ve created two functions for saving history: interactionsSave() and interactionsSaveCommit() — where the former would be called to mutate the proposed save object in RAM and the latter would commit that object to localStorage. interactionsSaveCommit() would be called every time a new speech bubble is created in DOM by the means of addBubble() function. Now everything should still work even if the browser can not access disk memory. As of today, the updated script is available through NPM as chat-bubble@next. It is already performing on our Google Chrome extension and so far is able to save a lot of headache for the users, as well as dramatically reduce perceived loading time. All of the code described here is available on this GitHub repo.